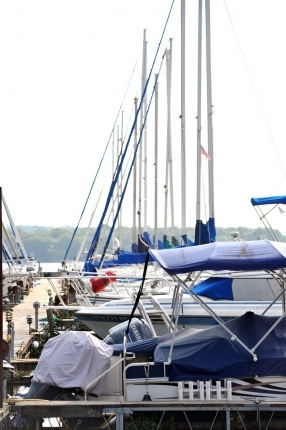 Nashville Shores Marina offers much more than a place to park or launch your boat. It's a lakeside community of hundreds of boating enthusiasts, new acquaintances and old friends - just 15 minutes from downtown Nashville and nestled in the rolling hills of Middle Tennessee. Located on beautiful J. Percy Priest Lake, Nashville Shores Marina welcomes all boaters to enjoy the recreational opportunities offered by the lake and the warm hospitality offered by our staff. Be sure to stop at the Captain's Quarters, our gift shop, to purchase anything you need for a fun day on the lake. Or, if you have a hunger for some good ole' Southern cooking, enjoy a delicious meal while listening to some incredible live music at Papa Turney's BBQ. Wet slip rates vary depending upon the size of the slip as well as associated amenities (i.e. patios, power, water, etc). Please contact the Marina Office at (615) 883-0413 for wet slip rental rates and availability. A limited number of covered boat ports are available next to the lake. The covered boat ports are perfect for families and other recreational boaters tired of "trailering" their boat, belongings, friends, and family over the open road. With a covered boat port, you are able to leave your boat next to the lake for easy access. Slips on the top of the hill adjacent to the marina are available to rent for $110 per month. Wet slip rates vary depending upon the size of the slip as well as associated amenities (i.e. patios, power, water, etc). Please contact the Marina Office at (615) 883-0413 for wet slip rental rates and availability. If you're looking for some summer fun out on the lake, but you don't have a boat, no worries! We have several pontoon boats for a relaxing day of fishing or a fun day on the water with family and friends. For Annual Slip Holders, Nashville Shores will rent a dry slip for vessels under 16 feet for a discounted rate of $15 per month. This slip can be used to keep a second vessel, jet ski or trailer. PLEASE NOTE: There is no boat or trailer storage/parking in the marina parking lots. This area is reserved for car/truck parking only. Being an annual slip holder entitles users to all amenities, events and special programs offered by Nashville Shores. This is obtained by signing a one-year contract to lease either a wet slip, wet covered slip, or covered boat port (on land). Rates for each of these varies based on the size of the slip needed. Please contact the Marina Office at (615) 883-0413 for rates for a slip that fits your boat. This is perfect for recreational boaters who trailer their boat. An Associate Slip Holder is entitled to launch their boat all season at the Marina launch ramp. It also provides many of the benefits of an Annual Slip Holder including discounts on season passes to Nashville Shores Waterpark. It is just $90 to become an Associate Slip Holder. You can purchase by calling (615) 883-0413 or at the Marina office during operating hours. Annual Slip Holders and Associate Slip Holders can purchase Season Passes to the Water Park for a discounted rate. Contact Shaun at the Marina office, (615) 883-0413, to receive the special rate.